Every year, there's an event in Stuttgart, Arkansas, where a Duck Gumbo Cookoff takes place. I've never been there, but I've heard a lot about it. This is not the type of duck that you get when you go to Yaya's Euro Bistro or any other upscale establishment serving duck. I once told my friend Kyle, an avid duck hunter, how much I paid for pekin (Long Island) and Fresh Magret duck breasts. His jaw dropped. That was back when I worked in pharmaceutical sales, though. When I earned the income of my company's top 5 percent of the reps in the country. Not there anymore! I'm back to the Simple Life now. So Kyle very generously gave me 18 duck breasts. These are Mallard from Stuttgart. My last batch of duck that I received from Kyle was slightly more gamey than what I usually get from him, so I consulted with Michael Roberts at Arkansas Foodies and Eat Arkansas. He informed me to soak wild game in cold water, and change out the water often to get as much of the blood out as possible. Then I soaked the breasts in buttermilk overnight per his suggestion. Perfect! Lastly, I didn't serve my gumbo with rice. I decided instead to top it with a healthy serving of crab meat from an economical can that I picked up from the grocery store. Just stir the meat into your gumbo to enhance the flavor. 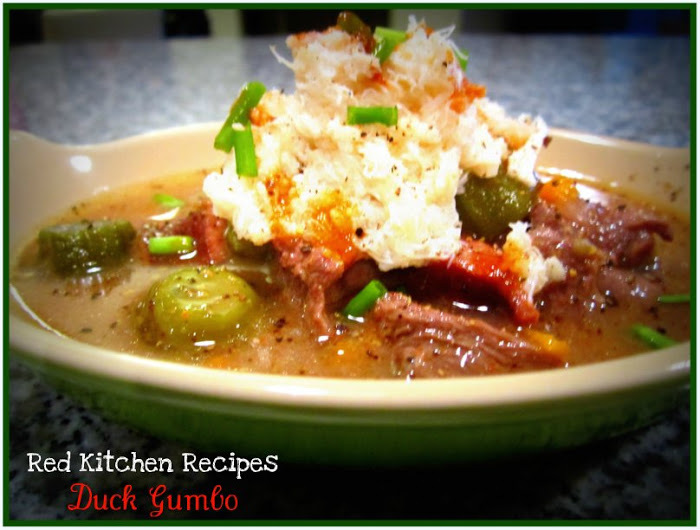 It's how I plan to serve gumbo up from now on! Heat a large stock pot over medium high heat. When hot, add enough peanut oil to lightly cover the bottom. Add the sausage, and cook until done, stirring often, about 8 minutes. Add onion, peppers, and celery. Cook until soft. Either mince the garlic or press into the mixture. Stir until fragrant about 3 minutes. Add the flour, a little at a time. Stir to incorporate. Continue stirring over medium low heat until it looks as brown as you like. Add the duck, stirring well. Add creole seasoning. Add broth, bring up to a boil, and cover. Simmer about an hour. At this point, you can add fish sauce like they do at Cook's Country. I love that I discovered this! About a tbsp or 2 will do it! Add the okra and tomatoes, bring mixture back up to a boil, then simmer again another 30 minutes, covered. To serve, top with crab meat, some hot sauce, and snipped chives. This looks fabulous. I wonder if I can get duck breast at Hillcrest Artisan Meats. Sounds like a great suggestion from Michael, that dude is like a book of knowledge. Glad the buttermilk soak worked for you, Thanh! The acid in the milk also helps tenderize the meat. Thank you guys! And Kevin if you want a whole duck sometimes Kroger Marketplace over by us has the Maple Leaf Farms brand, my favorite. Or if you just want boneless duck breast, usually Terry's FIner Foods carries the D'Artagnan brand. My son went to The Allen School for a few years, and I am chairing this year's gumbo cook off. We would LOVE to have you there! Feel free to call or email if interested. I'll give you a call tomorrow on this. Sounds good!